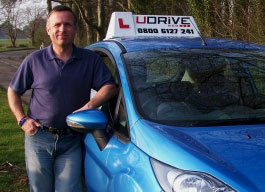 My name is Richard and I’ve been a driving instructor since 31 March 2004. I originally lived and taught in Birmingham, but moved to Metheringham during October 2012. Due to where I live, I can teach pupils who live in Lincoln, Sleaford and anywhere between. I pride myself as being very patient, understanding and caring towards my pupils, with having a great sense of humour, but professional in my approach to teaching. I have had pupils come to me from other driving schools who have made positive comments towards me and say they’ve learnt more with me in an hour compared with several hours with the others. I’ve spent ten years in the RAF and have driven many types of vehicles. I love my job as a driving instructor as it allows me to meet and teach people from different backgrounds, and, of course gives me a huge sense of achievment when they pass their test. I have a very good first time pass rate, whether taking hourly lessons or intensive courses. If your interested, please give me a call and I’ll look forward to meeting and teaching you and of course getting your driving test passed!